Last week, my friends Shiffy and Noam got married. And the weekend before the wedding, us girls got together for one last pre-wedding gathering to bond, talk, sing, and of course, eat. So when my friend Miryam challenged me to create decorated cookies for the event, I accepted her gauntlet, even though I'd never done it before. And so a very long day began...and ended with 80 pretty, frosted, delicious cookies. Though I'm sure many of you have done this before, this was my first time, and I was a little nervous. The cookies have two components: the sugar cookie and the icing. Sugar cookies I've done before, and my trusty recipe came through again here. 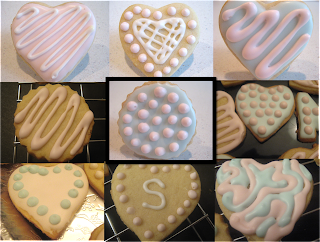 The recipe below should make about 100 heart shaped cookies - I used a 2 1/2" Wilton cutter. I made mostly hearts, but I also made a handful of circles, and about a dozen "S" and "N" cookies - I really had no advance plan, so anything went! The icing, however, was new. This type of icing is called royal icing, but why, I don't know. It is a simple mixture of egg whites, a small amount of liquid (I used lemon juice, but water would also work) and confectioner's sugar. A lot of confectioner's sugar. You can also add a little vanilla for flavoring (I didn't), but be careful with the amount of liquid in the recipe. If you're not comfortable using egg whites in the icing, you can buy pasteurized eggs, powdered eggs or a product called meringue powder. This icing is used for decorating cookies because it dries to a beautiful, shiny, hard finish - and you can add as many detail and layers as you want. The basic recipe (below) can be thickened with more sugar or thinned with more water as needed. Oh - and a word on food coloring. Gel food coloring is preferable, as it won't thin out your icing the way that liquid coloring will. Apply a little bit of the coloring at a time with a toothpick to the icing. And, as you know, when it comes to food coloring, less is more. You can always add color, but you can't take it out. Now back to our regularly scheduled programming. My first try, I used the icing straight out of the recipe, and spread it on the cookies with the back of a teaspoon. This was the result. Actually, preface to the side note. Where did a first time cookie decorator gain all these tips? Youtube of course. Search for "cookie decorating" on the popular video sharing site, and you will be entertained for hours. That is, if you're entertained by watching people decorate cookies. Back to the side note: There are many different ways you can put that first coat of icing on your cookies. The back of a spoon is one of them. You could also use a small paintbrush, or you could use a piping bag to pipe a line around the edge of the cookie, and fill it in with a squiggle of the icing, using a toothpick to nudge it into place. I used every method imaginable with these cookies, and with almost a hundred to experiment with, I had a lot of trials and a few errors. Now, I know in the past I've told you that ziploc bags and a hole cut in the corner work just as well as a piping bag - but not here. You can still use the plastic bag, but proper icing tips are essential. As are these: For those of you who don't know, this is a coupler. To use it, you place one end inside the plastic bag, and then place the icing tip over the outside, and screw the other end of the coupler over it. This does two things. Firstly, it gives the icing tip stability, and it also enables you to switch tips without moving the icing to a new bag. For those of you who are interested, I alternated between a #2 and a #5 tip for the decorating. Let's just say, by the end of the day, I had a dining room table covered with cookies, bowls of icing, used toothpicks, plastic bags, icing tips and food coloring. It may or may not have looked a little something like this. After you have put the first layer of icing on, it will start to harden immediately. As will any bags or bowls of icing you leave out for too long. After about a half hour, you can add more details to your cookies, but check with your finger that you have that smooth, shiny finish first. You don't have to give every cookie a first coat, however, and I left some without. But all the cookies got a decorating touch. Swirls, dots, lines, squigglys, and some writing - I was having fun. I stuck with three colors of icing: pink, blue and white. Practically no two cookies were the same. The one thing that went bad during my deluxe cookie decorating bonanza, was the photography. By the time I was done, daylight was long gone, and no matter how hard I tried the photos didn't come out how I wanted. Forgive me? After I delicately arranged each and every cookie on the platter, ate the few that wouldn't fit (about 75 of the original 90 baked cookies made it to Shiffy's house), I delivered the cookies. The next day, at our gathering, I couldn't believe every last cookie was finished before the end of the evening. Unlike the elaborately decorated cookies you can get in the bakery, these were truly delicious as well as pretty. And hard to resist. So I tried a new technique, Shiffy and Noam are beginning a new life together, and a new school year is just starting. While I'll no longer have the time now that I'm back in school to spend an entire day on cookies, I'm sure there will be many more firsts, both in and outside the kitchen, ahead this year. Tip of the Day: If you're worried about your cookies coming out well or you're a newbie like me, always make a handful more cookies then you need, so you won't be too worried if a few aren't perfect (and the ugly ones taste just as good!). Shape dough into 4 balls and wrap in wax paper and refrigerate overnight (or freeze for a couple hours). The cookies are gorgeous! You did a great job! I love reading your adventures, whether you'e baking OR mistaking. :) I stumbled across it somehow, and now I read it almost every day.